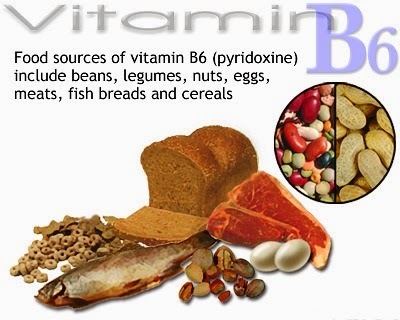 Vitamin B6 occurs naturally in poultry, fish, pork, cereals, eggs, vegetables and fruit. It’s also widely available as a dietary supplement. Vitamin B6, also known as pyridoxine hydrochloride, is essential for the breakdown of food by the body, and turning carbohydrates, proteins and fat into energy. It’s also needed for the production of neurotransmitters (chemical messengers in the nervous system) and proper functioning of the nervous system and the immune system. It’s also involved in the synthesis of hormones and red blood cells. Fight stress, Increase energy, Manage symptoms of pre-menstrual syndrome. B6 has also used in conjunction with magnesium to treat the behavioural problems of autism. However the use of supplements is a contentious area. Scientists argue that most people get adequate levels of B6 if they follow a good balanced diet, and there’s little evidence that vitamin B6 supplements can benefit different diseases. What Are The Risks From Vitamin B6? It’s not possible to take in too much vitamin B6 through a normal diet but research has shown that long term use of high doses of supplements of vitamin B6 may affect the sensory nervous system leading to loss of sensation in the hands and feet and permanent nerve damage (‘sensory neuropathy’). What Are The Recommendations For Vitamin B6? 1.4 mg/day for men 1.2 mg/day for women. Most people get this through a healthy diet and a serious deficiency is unusual. However there’s some research to suggest that some people may have mild deficiencies, especially the elderly (who often follow a more limited diet). People on a high protein diet with no leafy green vegetables or cereals, and those who drink heavily may need more B6. There’s some evidence that the contraceptive pill can interfere with vitamin B6 and women taking the pill may need a higher intake of B6. High dose vitamin B6 supplements (tens or hundreds of times higher than the RNI) are still promoted by some sources, for example to help treat depression and pre-menstrual syndrome, and to prevent heart and blood vessel disease (B6 plays a part in lowering blood levels of a chemical called homocysteine - high levels of homocysteine have been linked to heart disease but It’s not clear exactly what the relationship is). However the evidence for any benefit is very controversial. In 1997, the UK Department of Health’s Committee on Toxicity of Chemicals in Food, Consumer Products and the Environment (COT) considered evidence from more than 100 scientific papers, as well as evidence submitted by interested parties. They then released a Statement on Vitamin B6 Toxicity, recommending that the maximum daily intake of B6 from dietary supplements should be 10 mg/day.